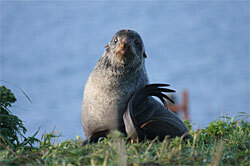 Each summer, nearly a million northern fur seals gather on these remote Bering Sea islands to give birth to their pups. Males weighing 600 pounds for more stand guard over their harems, going without food for up to three months. Millions of sea birds also descend on the rocky island outposts. Rare Asiatic vagrants and other “accidental” species happen by between mid-May and June. Birdwatchers may spot red-faced cormorants, red-legged kittiwakes, northern fulmars, thick-billed murres, horned and tufted puffins, parakeet, least, and crested auklets, and other interesting species nesting in the islands’ rugged cliffs and windswept tundra. Visitors may also see arctic blue fox, reindeer, sea lions, and several species of whales. The unique customs of the islands’ Aleut inhabitants and the legacy left by 18th century Russian explorers make the Pribilofs a destination of cultural interest as well. 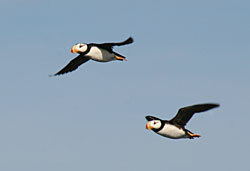 The best time to visit is between mid-May and August, when a variety of migratory birds and sea mammals are abundant. Fur seal numbers peak in July. Access to their rookeries and haulouts is restricted; visitors must use special observation blinds. Avoid disturbing seals lest they trample pups. Commercial flights are available to St. Paul or St. George from Anchorage. Inter-island flight service depends on weather. Special tours are available for birders and other wildlife watchers.